Hi good folks at Misicmakers! Thanks for your note. Overall, I am VERY happy with the dulcimer and stand kits, and just finished assembling and finishing them both. When done slowly and carefully as per your very clear instructions, I am very sure that this will be an instrument that will give me great satisfaction for years. Although I am new to dulcimers, the sound is really pleasing!! 1. All materials seem "first-rate" with really pretty wood. 2. The kit assembles easily, and just as instructed in the assembly instructions. 3. I used clear brushed lacquer as a finish, and am very pleased with how it turned out. 4. The tip about using a non-running drill press to push in the tuning pins was EXCELLENT. I would not have thought of it, and it is so much better than bashing them in with a hammer. 5. 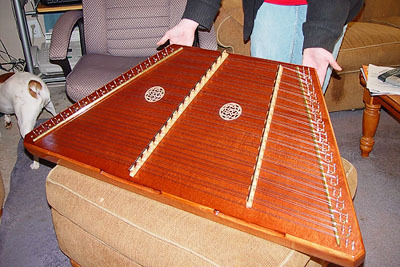 When stringing the dulcimer I discovered that the tuning pins are screw-threaded and the distance between the string holes in the pins and the top surface of the dulcimer decreases as the string is wound onto the pin. With the strings cut with 3" of excess, this becomes a problem because the "space" of about 1/4" between the string hole and the surface of the dulcimer decreases. I found 2" of excess to be just about perfect. It would have been helpful to know that this would happen as the strings are installed. 6. Of a very minor nature - I was meticulous about positioning the frame on the back as directed (uniform overlap all around) and positioned the top exactly in alignment with the back. I was somewhat disappointed to find that when the pin holes were drilled as per the pre-punched indicators, the "gap" between the tuning pins and the edge of the dulcimer was not uniform left/right. Kind of a minor thing, but I noticed it and would have preferred that they be symmetrical left/right. 7. The pre-drilled holes in the bridges for the short derelin indicator pieces had to be opened up with a 1/8" drill in order to get the derelin pieces into them. Might want to note that in the instructions, as I could NOT make them go in without re-drilling. In all, I am extremely pleased with your product!! I am sure I will enjoy it for years! Yes, a very enjoyable experience to build my very own hammered Dulcimer. The instructions provided are very detailed and to the point. As of now I am about half-way through construction and have not encountered any difficulties. As you might know from my communication with you, the two hammers were missing from the shipment, but I was told that a set will be shipped by UPS, so no problem. Thanks again for a great DIY project. I bought the hammer dulcimer kit. We got it on a Friday and I had it finished and tuned by Sunday evening... It was fun to build, turned out beautiful and we have enjoyed learning to play it... Thanks for a quality product. I purchased the plans and hardware kit for the Musicmaker's 17/16 HD in November and was practicing "Ode to Joy" by Christmas. It sounds great! The instructions are well written and the full scale drawings are great. I used black walnut for the pin blocks and rails. African mahogany for the sound board and inlaid banding to conceal the edge of the plywood backboard. Thank you ! Just wanted you to know that I finally got around to building the 17/16 hammered dulcimer kit I purchased from you. I am absolutely pleased with it in every respect. I built it exactly as directed. Whoever designed it got everything right. I see your name on the plan sheet. I previously had purchased the plans only, then decided that it made sense to build from a kit so purchased the kit. I have been playing it a lot and am amazed how quickly it has "matured". Just lovely in every respect. I couldn't be happier. So here is a short video of it being played. I am just a beginner but sure do enjoy it. It isn't my first dulcimer. My first was one I designed and built myself after much reading and research. Took lots of fiddling to get it playing acceptably. I have acquired two other professionally built instruments and they are nice but my new 17/16 is by far the nicest. I should never need another instrument. I will recommend this one if anyone wants to build their own. I am impressed with using the screws for hitch pins. They were easy to install, made stringing dramatically easier, and look just fine. In fact, I have been surprised at how nice they look on the finished instrument. Glad you described their advantages in the builders manual and convinced me to use them. I have been extremely pleased with the 17/16 hammered dulcimer built from your kit and on the service provided by you and your staff. As a retired "bean counter" who had never built anything in the past, I was not sure if I would manage to build a musical instrument, but your kit instructions and the kit itself made it relatively easy. I have donated the dulcimer to the music ministry of our church and it will also be used for music lessons in the school that the church runs. They are extremely pleased with it and you might just get some more enthusiasts asking for your kit! I just finished building my hammered dulcimer. I am very happy with the results! You guys are great. Everything fit perfectly and was very easy to build. This is the first insturment that I built and was not sure what to expect. You sure made it easy with your kit. I haven't tuned it yet, but I think it will sound very nice. Matt said you folks like to see photos of completed customer built kits... so.... here's my 17/16 Hammered Dulcimer. Thanks for the fun I am having... a lot of enjoyment building the kit and more as I learn to play it. I LOVE the instrument. I enjoyed building it, and am REALLY pleased with the tone. I like the tone FAR better than another make I owned years ago. My husband has finished, sanded, and assembled the adjustable hammered dulcimer stand and I love it! The angle of play takes the pain out of my back and I like the looks of it as well. Thanks for a great product. My husband enjoyed doing it as well. My wife and I purchased the plans and hardware for the 17/16 cedar hammered dulcimer kit for Xmas, 2002. I begin the project during the second week of January, 2003, and this past weekend finished its first tuning. I just had to pass along a picture of the finished dulcimer. The soundboard is cedar, the frame is cherry, and the bridges are maple. I also chose to make a cherry bottom for it instead of using any plywood. This is my first musical instrument, but my wife is familiar with instruments and she believe the cherry bottom has resulted in a clearer sustain for the instrument. You may also note that I chose to add cherry to all sides of the instrument to hide all joints and piece ends. It was a little bit of a pain to mniter all of those sides, but the result was worth it. Thanks for providing such clear, precise instructions and blueprint.This was a lot of fun and the compliments are pouring in! 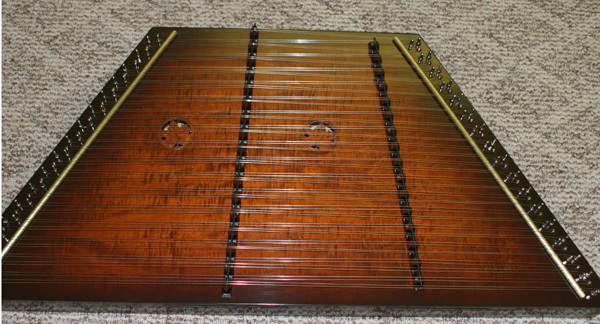 Having purchased my performance dulcimer the last Saturday of October, I am very happy with it. It is the first time I have tried an instrument and felt that in just a few hours I could play something that sounded like the song I was trying to play. I have been working through the Teaching Yourself Hammer Dulcimer and find it helpful. Thank you for encouraging me on the larger one. I feel I would have been disappointed in the smaller one. I am really enjoying myself and am looking forward to going to some jams and learning to play along. Thanks again. I'm so very pleased with your kit, instructions & the results (see photo) of our Performance dulcimer and stand. It's such a delightful instrument with full sound. I built this all by myself, no male help, except he (hubby) showed me how to run a drill press, but he didn't do the work for me. Coincidentally, last year I met a lady in my area who also has one of your dulcimers. We have become friends and meet every week with two other ladies to play our hammered dulcimers. I'll match my dulcimer to their instruments any day! I received your parcel on November 23; I worked on it through 3 evenings and I enjoyed it very much. 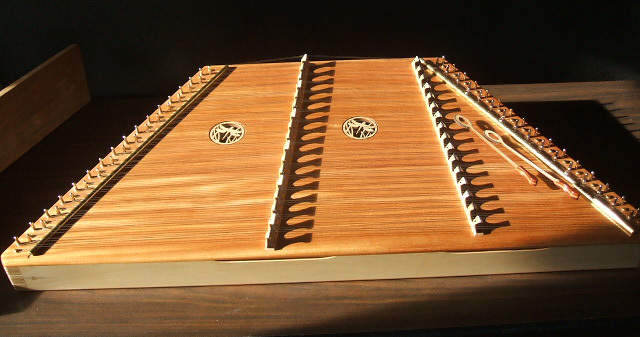 For me your Hammered Dulcimer is perfect! Thank you very much indeed. After two months of ownership of your performance hammered dulcimer I wanted to take the opportunity and express in writing my extreme satisfaction with my purchase. Your performance dulcimer model is a superior instrument, second to no other dulcimer that I have had the opportunity to play or hear in-person. Having been enchanted with the sound of the dulcimer for some 15 years I have had the opportunity to play and hear many of your competitors, including the "professional" models of acknowledged industry leaders and standard bearers. The Musicmaker model is uniquely capable of a sweet, harpsichord-like tone not previously found in my searching for that "perfect" dulcimer sound. I believe the instrument's superior redwood top in combination with your unique internal bracing/tone bar configuration best accounts for the particularly beautiful tone of the instrument. I have played dulcimers three times the price of the Musicmaker that pale in comparison to my instrument. Tuning stability, always a major concert of mine, is also excellent. In summary, thank you for making excellence affordable. I would have been hard pressed to justify spending $1500 + on a quality instrument capable of approaching my demanding standards. Having purchased my Musicmaker "in the white" I feel especially happy with the relative bargain I've enjoyed. Your track record deserves my patronage, acknowledgment, and the word of mouth advertising I have given my numerous musical friends.